Do you struggle with the removal of stubborn stains, water streaks and dust build-ups from your windows? Do they cost you too much effort and you don't want to take part in this chore? This process will no longer consume a lot of your time and energy! The specialists of window cleaning in Holborn Viaduct are going to render you assistance! You will be able to use your spare time as you wish – the skilled and reliable professionals will deal with the wiping and scrubbing. We offer careful cleaning services for all kinds of glass surfaces. Read further and discover more about the different advantages you can have. We also provide our professional services in nearby areas: St Luke's, Goswell Road, Smithfield, Aldersgate, Angel. 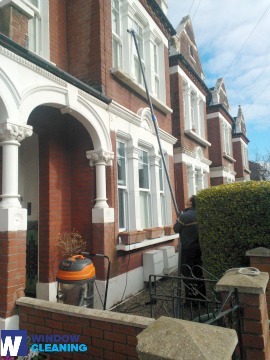 We use advanced methods of window cleaning to make sure you will have superb end results. With the water fed pole cleaning system, jet washing and rope access equipment, you can be sure that your property's glass surfaces will be crystal clear. Besides that, your property is in good hands – the cleaners are completely insured and comprehensively trained. The water fed extension poles are attached to water supply reservoirs in the vehicles, while our rope access guarantees safety – even when we clean tall buildings. You can profit from these options today – dial 020 3746 3113! You can depend on the cleaners for both domestic and business window cleaning. Every kind of glass surfaces are included in our professional routine. For instance, you can book a service for cleaning small or double windows, French doors, sash windows, bay windows and patio doors. In addition to these, we wash and polish garden window surfaces, conservatories and skylights. At home or at the office, you can always ensure crystal clear glass – just phone us! We have the right skills and the right techniques for the assignment. You will have perfectly looking work environment with the help of the adepts of commercial window cleaning. You can depend on our high end services for all kinds of business premises. If you own a small shop, we can completely wash its windows by using our water fed extension pole system – it gives us the chance to reach up to the fourth floor. If you require spotless look for the glass panes of a tall business property in London and the nearby areas, we will make use of our rope access equipment. In any case, you will enjoy excellent results immediately. Book our quick and dependable domestic window cleaning in Holborn Viaduct. We will clean the windows of your home both inside and outside. The products we use are safe - you will enjoy the perfect results and be green aware. In addition, we use only purified water. Don't wait, dial 020 3746 3113 and order our second-to-none services. Our customer representatives will take care of you – they are accessible 24/7. As an alternative ways of booking – our request a cleaner online form or just chat with our representatives.